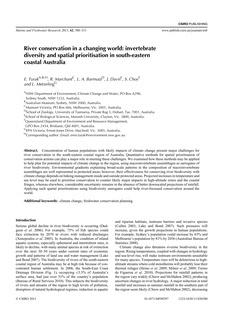 Concentration of human populations with likely impacts of climate change present major challenges for river conservation in the south-eastern coastal region of Australia. Quantitative methods for spatial prioritisation of conservation actions can play a major role in meeting these challenges. We examined how these methods may be applied to help plan for potential impacts of climate change in the region, using macroinvertebrate assemblages as surrogates of river biodiversity. Environmental gradients explaining broad-scale patterns in the composition of macroinvertebrate assemblages are well represented in protected areas; however, their effectiveness for conserving river biodiversity with climate change depends on linking management inside and outside protected areas. Projected increases in temperature and sea level may be used to prioritise conservation to counter likely major impacts in high-altitude zones and the coastal fringes, whereas elsewhere, considerable uncertainty remains in the absence of better downscaled projections of rainfall. Applying such spatial prioritisations using biodiversity surrogates could help river-focussed conservation around the world.